The Lords prayer teaches us to ask for the kingdom of God,and for His will to be done in the earth as it is in heaven! (Matthew 6:10).Many know of the passage found in revelation how one day there will be no more pain or tears,but we can experience heaven upon earth through the holy spirit here and now.When the Lord sent out the seventy they were instructed to say unto those who were healed of sickness that the kingdom of God has come near unto them(Luke 10:9). 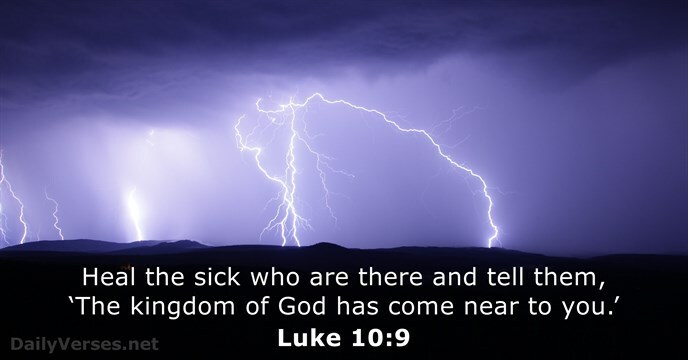 9 And heal the sick that are therein, and say unto them, The kingdom of God is come nigh unto you. Hebrews speaks of the powers of the world to come by being partakers of the holy spirit,even to put to an open shame one who has fallen away from the faith that they repent and return to what they know is right(Hebrews 6:3-10). 3 And this will we do, if God permit.4 For it is impossible for those who were once enlightened, and have tasted of the heavenly gift, and were made partakers of the Holy Ghost,5 And have tasted the good word of God, and the powers of the world to come,6 If they shall fall away, to renew them again unto repentance; seeing they crucify to themselves the Son of God afresh, and put him to an open shame.7 For the earth which drinketh in the rain that cometh oft upon it, and bringeth forth herbs meet for them by whom it is dressed, receiveth blessing from God:8 But that which beareth thorns and briers is rejected, and is nigh unto cursing; whose end is to be burned.9 But, beloved, we are persuaded better things of you, and things that accompany salvation, though we thus speak.10 For God is not unrighteous to forget your work and labour of love, which ye have shewed toward his name, in that ye have ministered to the saints, and do minister. The day will come when wickedness will have no place in the earth,and when the seventh angel sounds it is then the kingdoms of this world will become the kingdoms of our Lord,but in the mean time we are more than conquerors by the blood of the lamb and by the word of our testimony will we rejoice by the spirit given unto us! (Revelation 11:15…..12:10-12). 15 And the seventh angel sounded; and there were great voices in heaven, saying, The kingdoms of this world are become the kingdoms of our Lord, and of his Christ; and he shall reign for ever and ever. 10 And I heard a loud voice saying in heaven, Now is come salvation, and strength, and the kingdom of our God, and the power of his Christ: for the accuser of our brethren is cast down, which accused them before our God day and night.11 And they overcame him by the blood of the Lamb, and by the word of their testimony; and they loved not their lives unto the death.12 Therefore rejoice, ye heavens, and ye that dwell in them. Woe to the inhabiters of the earth and of the sea! for the devil is come down unto you, having great wrath, because he knoweth that he hath but a short time.